If you love Christmas as much as we do, you know how important it is to decorate your home for the holidays in a way that best reflects you and your family. Whether you’re planning to entertain relatives, friends, or colleagues, turning a holiday home into a place of warmth and joy is all about incorporating multi - dimensional Christmas lights, ornaments, and displays. Our selection of plush holiday figures has something for everyone, and includes a wide range of characters, animals, and—of course—Santa himself. 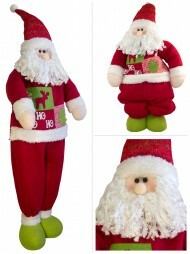 Plush Christmas figurines come in sitting, standing, or hanging designs to suit the diverse needs of your holiday decorating. For exciting display arrangements, add a few delightful characters to the edge of your shelves, mantels, and side tables. Add sitting plush figures and watch as they gain their strength for the holidays by relaxing with their legs hanging over the edge of your display shelves. These adorable miniatures add personality and charm to your seasonal décor, making each one an instant household favourite. 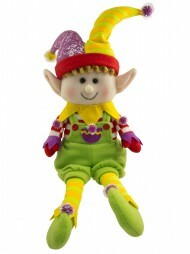 Standing plush figurines add height and dimension to your shelf displays or table tops. 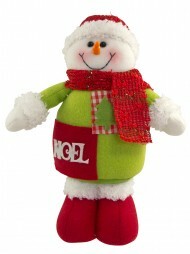 Set your standing figurine on your coffee table, side table, bookshelf, or office desk to enhance the joy of the season. Standing plush figurines look especially charming next to a lamp or centrepiece, and serve as a welcoming figure beside your Christmas candy dish. 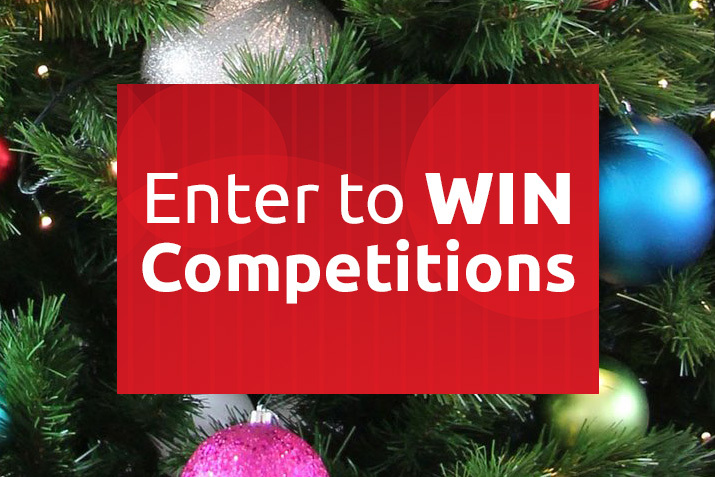 Hanging plush ornaments add an adorable element of surprise to your tree decorations or garlands. Hang Christmas plush characters on your hallway banisters, cabinets, or workspace areas to build excitement for the holidays and bring cheer your friends, colleagues, and family members. 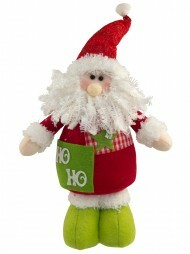 Display your independently standing plush figurine alone, or combine your plush figurine with other festive design elements. Create your own custom centrepiece for your Christmas dinner or holiday party by combining foliage and ribbon with a charming Christmas plush. Place your figurines at the base of a pillar candle holder or holiday bouquet for an instant touch of seasonal style. Set your plush by your miniature Christmas tree to create a delightful holiday scene, complete with tiny wrapped gifts and other size - appropriate ornaments. Personalize you holiday wreaths with a plush character ornament of your choice, or mix and match similar plush figures to design your own holiday wreath scene. Whether you’re creating a team of Santa’s elves or adding a portable desktop snowman to your workplace, Christmas plush ornaments are a great way to dress up your space for the holidays. 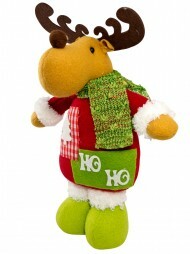 Choose your favourite Santa plush or opt for a festive reindeer to celebrate your most beloved seasonal characters. Soft plush features resist damage and can be safely handled without fear of chipping or cracking. If you life in a busy home with children or pets, Christmas plush is a safe decorating choice that resists breakage during falls or unexpected playtime. Plush ornaments are a great defence against pets who enjoy getting into everything. Avoid the usual holiday destruction at the hands or your dogs and cats by preparing your decorations with non - breakable plush items. For hectic workplaces or reception desks, the plush brings the joy of the holidays to your desk without added stress of breaking or dropping your Christmas décor item. The plush ornament stands up to the shuffling of papers and stray elbows, and is easy to move during times when you need more space to work. Because they’re safe to handle, friends and family can fully appreciate the attention to detail that is apparent in each unique plush ornament. Their soft multi - texture construction features crafted clothing, holiday accessories, and realistic fur and fibres. The detail of each plush item brings your characters to life, whether it’s with Santa’s soft fuzzy beard, an elf’s perfectly pointed ears, or a snowman’s rosy cheeks and carrot nose. These loveable plush ornaments offer a wide array of versatile display options and will delight your Christmas guests year after year.